A key element of CLIMATE FOR CULTURE is the use of high-resolution simulation models of future climate conditions in different parts of Europe and neighbouring Mediterranean regions, and how these conditions may alter the structure and stability of historic buildings and the collections within. Before the project started, only low-resolution data from global models existed. Therefore, high resolution climate models are developed during the project which, for the first time, are coupled with whole building simulation tools. To assess the damages to cultural heritage in the near and far future, the project considers two different scenarios from the Intergovernmental Panel on Climate Change (IPCC) using different estimates for future carbon dioxide emissions. These combine a range of assumptions about factors that can influence carbon dioxide emissions such as population growth and decline, future energy demands, new and more efficient technologies and strategies for reducing these emissions. According to the World Meteorological Organisation, the term climate can be defined as ‘the statistical description in terms of the mean and variability of relevant weather quantities over a period of time’. Climate covers different weather elements such as temperature, air humidity, wind, clouding, precipitation, sun shine duration, air pressure, snow fall, radiation and evaporation. All these parameters, including their interactions with the atmosphere, the hydrosphere, the cryosphere, the surface lithosphere, the biosphere and the resulting carbon cycles, are integrated into so-called general circulation models. Referred to as global climate models (GCM) they are the most complex computer models existing up to now. But global climate models must also take into account parameters which cannot be calculated and for which no fixed values from the past exist. CLIMATE FOR CULTURE includes such projections for high resolution climate simulations by investigating two scenarios: The first is the A1B scenario from IPCC's 4th report predicting a greater CO2 emission increase assumed until 2050 and a decrease afterwards. The second, known as RCP4.5, is a scenario which will be published as part of the forthcoming 5th report of the IPCC in 2014. RCP 4.5 stands for Representative Concentration Pathway (RCP) 4.5 and is a scenario of long-term, global emissions of greenhouse gases, short-lived species, and land-use-land-cover which stabilizes radiative forcing at 4.5 Watts per meter squared (approximately 650 ppm CO2 equivalent) in the year 2100 without ever exceeding that value. Within the project both scenarios are calculated for timeframes spanning the years 1960 – 1990, 2020 – 2050 and 2070 – 2100 and with datasets prepared for a range of climate variables including rain, temperature and ground temperatures, air pressure, wind speed and direction, cloud coverage, relative humidity and global and diffuse radiation. This entirely new high resolution simulation is perfomred over entire Europe and the Mediterranean region by using the regional model REMO which has been developed at the Max Planck Institute for Meteorology, Germany (see below). These climate indices from the two climate scenarios are then coupled with a whole building simulation software developed especially for historic buildings to estimate more systematically future thermohygrometric changes and its damage potential for collections. It has been shown in several EU-funded projects (e.g. PRUDENCE, ENSEMBLES, NOAH's ARK) that an ensemble of global and regional climate models can provide credible quantitative estimates of climate evolution over the whole of Europe. 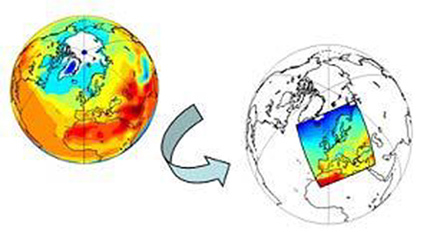 While coarse resolution global circulations models (GCM) successfully reproduce climate features on continental scale, only high-resolution regional climate models (RCM) with a resolution of less than 50 km are a reliable source of climate change information required for impact study on regional levels. Against this background, CLIMATE FOR CULTURE uses the regional model REMO which for the first time allows to obtain data from a spatial resolution of up to 10x10 km grid size by dynamical downscaling (see figure 1 below). REMO is coupled to hydrology and ocean models allowing to also simulate sea level changes under selected climate change scenarios and will be further developed for better prediction accurancy of the consequences of climate change for cultural heritage. Climate change according to the Intergovernmental Panel on Climate Change (IPCC) refers to a change in the state of the climate that can be identified (e.g. using statistical tests) by changes in the mean and/or the variability of its properties and that persists for an extended period, typically decades or longer. It refers to any change in climate over time, whether due to natural variability or as a result of human activity. As outlined in the Assessment Report AR4, it is likely that there has been significant anthropogenic warming over the past 50 years averaged over each continent except Antarctica. It is said that most of the observed increase in global average temperatures since the mid-20th century results presumably from the observed increase in anthropogenic greenhouse gas concentrations. For that reason, the hypothetical scenarios of CO2 and other greenhouse gas emissions are taken into account in the climate simulations in CLIMATE FOR CULTURE.